Weekly Photo Challenge: Good morning, Bear! In the meantime, one of the first orders of business as I get back into a routine is to visit my long-suffering horse, Bear. 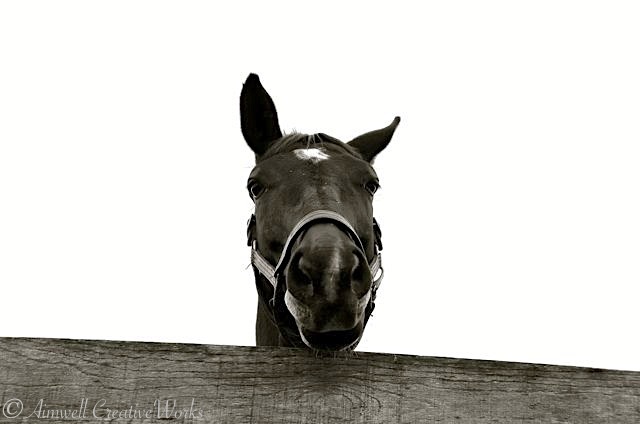 This entry was posted in Animals, Equestrian, Musings, Photography, Shout Outs, Travel, Uncategorized, Weekly Photo Challenge and tagged Aimwell CreativeWorks, black and white, Dorothy Chiotti, England, Equestrian, Equine image, Horses, Light and shadow, Photography, postaday, Travel. Bookmark the permalink. I bet he missed you!! Or possibly, “why the heck is she pointing that thing at me again?” 😀 Nice photo too. This is a distinct possibility … 🙂 And I don’t believe it’s totally conditional on me supplying an endless stream of carrots … 😉 … Thanks, Valerie!